So today I get a text at work from my wonderful boyfriend. He says, “Babe, I took out the chicken, please make it ;).” First thing that runs through my mind is, “he wants chicken, AGAIN?” There’s only so many chicken recipes I can make for him because he’s not eating a lot of things right now. He’s been on this healthy lifestyle change for the past 4 months, has dropped about 60 pounds and I am extremely happy for him and don’t want t mess it up by adding rice to his diet before he’s ready. Anyway, I think “well there’s broccoli in the freezer, why not make chicken and broccoli.” DONE! Menu made. Right? No! Its a simple recipe to make but I’ve never made it, so I take to the internet and a research and stumble upon a wonderful Martha Stewart recipe for chicken and broccoli. Its a little different from your Chinese restaurant version but I think, “hey, its Martha, you can never go wrong with Martha.” So I print out the recipe, stop by the market on my way home to get a few things I’m missing to make it and Voila! I’m ready. I get home, unpack all my stuff. His mom hasn’t been feeling well lately so she’s in her room resting and I have the whole tiny kitchen to myself! So I gets to cook’n. Being the Hispanic woman that I am, I followed, maybe, one of these steps. Take into consideration, I’m only making for Christopher, not for four people, so I had to alter a few things. I didn’t use the rice vinegar, I used balsamic vinegar. I omitted the honey and cornstarch all together. Instead of canola oil, I used olive oil. I added more then 1/2 tablespoon of crushed red pepper flakes because I know Christopher loves his spiciness and I added a little more than was asked of garlic because I LOVE garlic! I didn’t really measure the cuts of chicken and I eyeballed all the ingredients. Anyway, I followed the first step of mixing all the ingredients together and let the chicken marinate, while I cooked the broccoli along with the lemons and I added a bit of white onions 🙂 I removed the broccoli, lemon and onions and added the chicken along with all its juice and cooked it until it was nice and tender and then added the broccoli and lemons again so that it could cook with the juices. 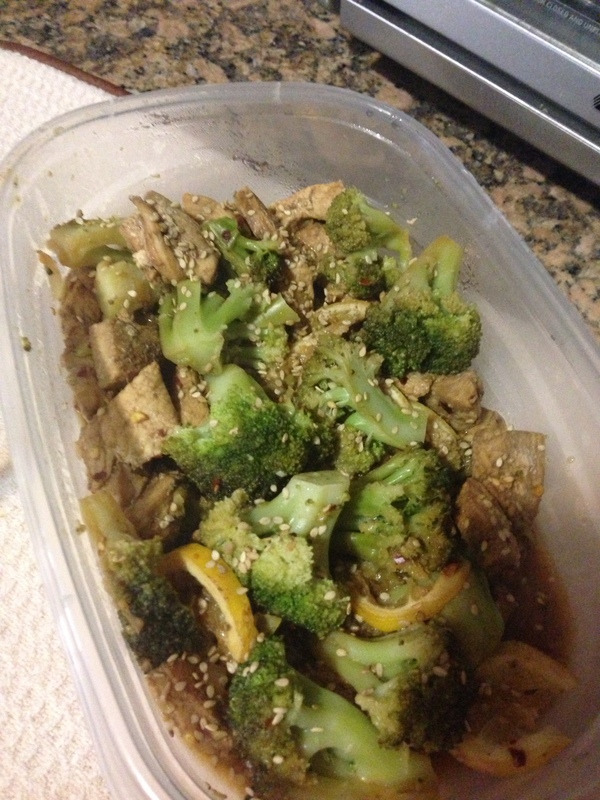 Once it was done I piled it into a tupperware and sprinkled sesame seeds on top. The other half of the mixture that she said to put aside at the beginning of the recipe, I put in another little tupperware, in case he wanted to add more to the food when he ate it. So of coarse, being the wonderful chef that I am, I tasted my creation. It was so tasty, that I had to physically stop myself from eating Christopher’s lunch. Pat on the back for me and many thanks to Martha for the template on how to make chicken and broccoli. I will one day follow this recipe down to the tee because I’m sure its even better then the one that is sitting in the fridge.